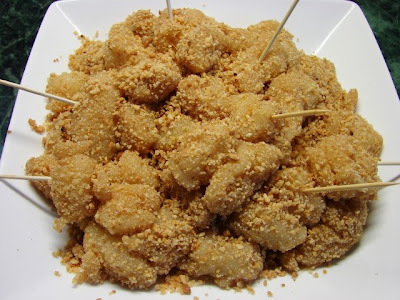 Muah chee is a Malaysian-Chinese snack originated from Penang. 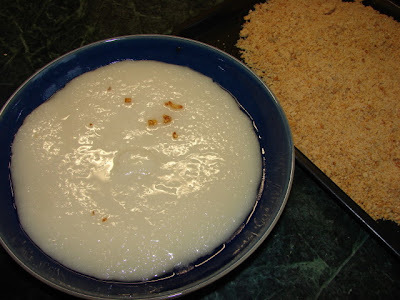 This is made with small lumps of glutinous rice dough coated with a ground peanut mixture, soft and chewy similar texture to Japanese Mochi or Cantonese sticky rice balls (lui sa tong yuen 擂沙湯丸 or lo mai chee 糯米糍). Not the prettiest snack but yummylicious. It's easy to make. Best eaten within few hours at room temperature, if keep in the fridge the dough texture will turn hard. Brush the steamed dough with shallot oil and leave to cool slightly. scoop small pieces of dough onto the peanut mixture. Make the peanut mix by putting peanuts, sesame and sugar in a food processor and blitz to a fine mixture. Mix the dough batter ingredients together. Pour into a deep dish and steam for about 25 minutes. Test the centre to make sure it is cooked through before taking it out of the steamer. Brush the dough with a little oil. Leave to cool down slightly. Spread the peanut mix on a tray. 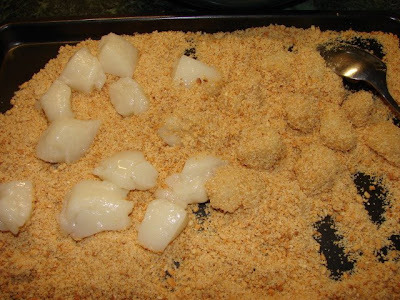 Scoop small pieces of the dough onto the peanut mix then toss to thoroughly coat them. Can press the dough pieces lightly to coat with more peanut mix. Ready to enjoy. * to make shallot oil, thinly sliced one or two shallots. Fry with 2 parts the oil to 1 part shallot till golden brown.